New Year's eve revelers the world over will be singing the familiar refrain "for auld lang syne" as we welcome 2019 on Monday at 12 p.m. So what are the song's origins? 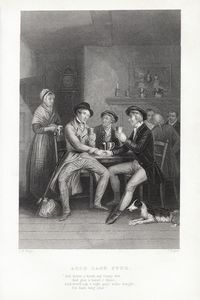 Scottish poet Robert Burns penned the lyrics in 1788, likely drawing on earlier Scottish "parting" songs, though Burns' words were not put to song until after his death. In contemporary language, "auld lang syne" translates to "the good old days" or "back in the day," and the poem indeed exudes warm nostalgia for the days we leave behind us. Shirley Temple sang it to a dying soldier in the 1937 film Wee Willie Winkie. The cast of It's a Wonderful Life sings it in the 1946 film's final scene. But perhaps the most heartbreaking instance was during the 1914 Christmas Truce at the outset of World War I. German and English soldiers on the Western Front momentarily laid down their arms and left their trenches to exchange food and gifts and sing songs, one of which was "Auld Lang Syne." Here are Burns' original verses followed by the English translation. And give me a hand o' thine !